Originally published for the American Beekeeping Federation's September "E-Buzz"
The highlight of my “Kids and Bees” adventures this summer was, without a doubt, joining the Montana Farmers Union’s 2018 Youth Camp. Mid July I traveled to the Highwood Mountains where I spent a week with about seventy 12-14 year-olds, plus a big handful of 17-19 year-old camp counselors, and the impeccably organized and on-the-ball camp staff. 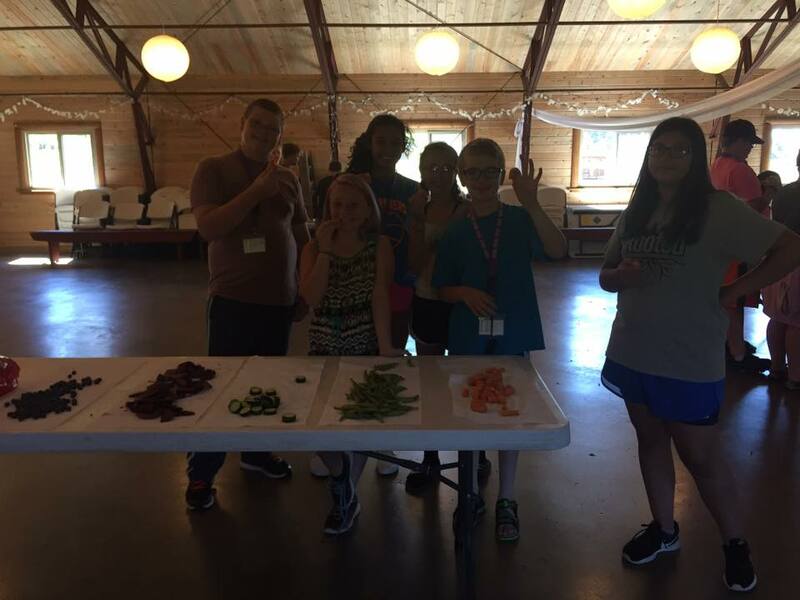 The campers, and staff, come from the city of Great Falls, surrounding farming areas, and a few came from far away states (we even had one Alaskan!). Participating as a leader at summer camps gives me an awesome opportunity to “test” the activities I read about, or think up, on large groups of kids to see what really works. I look to answer a few questions: Which lessons and activities help kids understand the importance of bees? What helps them feel more personally invested in bees and beekeeping? What do they love doing? What activities are the most fun? And which activities are the best for me to teach others to do in my “train the trainer” workshops? This summer we did the standard favorite activities of honey tasting, beeswax candle rolling, seed ball making, I also taught lessons on bee products, bee conservation on the farm an in the backyard, and of course, I handed over my hive tool and smoker and let the kids explore live beehives! This year I added two new activities that I’d like to share with you: encaustic art postcards, and a “Montana farmed – bee pollinated foods” tasting table. Next month I’ll tell you about the postcards, but today I’d like to give you my lesson plan on the tasting table. Photos/printouts of the flowers of the foods you have, and photos of the bee(s) that pollinate(s) them. Step 1: Visit your local farmer’s markets and food co-ops to find fresh and delicious food pollinated by bees. If you are not sure, here is a list of foods that require direct pollination (http://pollinator.org/list-of-pollinated-food). You can also talk to the farmer and ask them. Don’t forget that there are many other foods (not on this list) that need bees’ pollination services to produce seeds, i.e. carrots, lettuce, etc. I used carrots, beets, peas, cucumbers, blueberries, and canola oil (grown and pressed in MT). I also used Montana grown, milled, and baked wheat bread to dip in the oil. Step 2: Cut up the food into bite sized pieces, pour oil into cups, tear the bread into pieces, and lay out on a large table. Step 3: Have the students come up to the table in groups of 5-6 (we organized this activity with three other activity stations that they rotated to every 8-10 minutes). Step 4: Introduce them to all of the foods on the table, and let the kids know where you got all of the foods. Make a big deal out of the fact that it’s all local and fresh. Some of the kids will be super grossed out at the idea of eating a raw veggie. Let them know that they must take a bite of everything, even if they think they don’t like it. If they don’t like it after the first bite, they can throw the rest in the compost. Step 6: With each individual taste, ask them if they have seen the flower of this food before. Ask them to describe it to you. Is it a bush, a vine, a root? Show them the picture of the flower. Pea and blueberry flowers are pretty common, while beet and lettuce flowers aren’t, which really gets them to thinking. Ask them what they think the pollinator of this flower is. Then show them an illustration or a photo of the bee (or other pollinators) that pollinates the food’s flower. Try and find blueberries or tomatoes so you can explain “buzz pollination.” Grain (the bread) isn’t pollinated by bees, it’s fertilized by the wind blowing pollen from one flower to the next. But for a bonus- ask them what bees might have to do with the health and yield of the grain? (While the fields are fallow (resting), they are usually planted with nitrogen fixers like clover and birdsfoot trefoil, which are pollinated by bees.) One of the campers comes from a family farm by Billings and totally rocked this question out! Asses Students/Campers: After you have gone through all of the foods, flowers, and bees ask them which food was their favorite. Pick a random food and ask them to tell you how it’s pollinated, and who pollinated it. Ask them to tell you something they didn’t know before coming to the table. Ask them if they’re more likely to eat more locally grown foods in the future. A few notes: I was blown away by the amount of students who had never had a pea or a blueberry before. Only about 5% of the kids had had a raw beet. The reactions were amazing! Most of the kids didn’t want to try the cucumbers, as they are usually bitter and dry. However, the market cucumbers were sweet and juicy and the kids kept asking for seconds. The least favorite food was the beets, in the future I might blanche them to soften them up. None the less, there were still kids that went bananas for them! When all of the stations had been rotated through, and the groups were waiting for the call to line up at the door, the kids swarmed the tasting table a begged to finish up what was left. They went ballistic for the sweet carrots and peas, and were using bread to mop up canola oil that spilled on the table. There wasn’t a scrap left (OK, except for a few beets), and the campers were trying to figure out how they could launch a campaign to move sugar drinks out of the cooler to make room for fresh fruits and veggies in their camp store co-op. Seriously!! I almost cried happy tears. Our large annual event “Kids and Bees” at the 2019 American Beekeeping Federation Conference and Tradeshow is coming up fast! We’re looking for about 30 volunteers to help teach kids all about bees at the conference in Myrtle Beach. For more information on volunteering, or to sign up, contact Mackenzie Brubaker at mackenzie@beegirl.org or 541-709-1127.